The NW-A840 is a thin Walkman at only 7.2mm, and available in 16Gb, 32Gb and 64Gb. 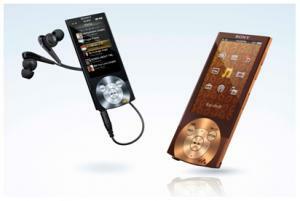 It has a TV-out with 720x480 resolution, S-Master digital amplifier, FM radio and noise canceling. It does not have a touch screen or WiFi. Sony says that the battery life will be 29 hours for audio and 9 for video (at 384kbps MPEG-4). The NW-A840 is available in Japan for 263$ to 439$, and the 16GB version is coming to the UK on April 13rd for £150 (for the 64Gb version).